"Collioure, a town only about 15 miles from the Spanish border and 18 miles from Perpignan, has an art history that goes back to when French artist Henri Matisse started painting in the small town over a century ago. The art scene in Collioure is constantly evolving, with some artists coming to the commune to work simply because of its reputation as an artists’ colony. So there I am in this fine November afternoon. Standing in Port Avall with my small Canon G1X and my tripod - on my way back to our apartment. 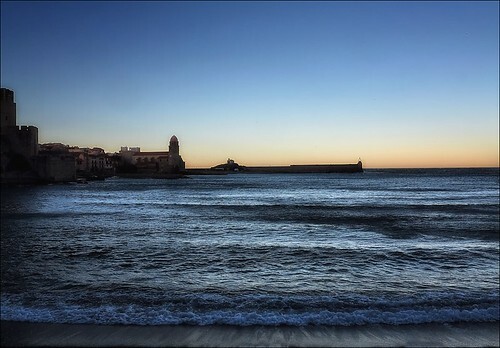 Of course I stop just there in the beginning of the blue hour and make this photo souvernir right at the beach looking towards the church Notre-Dame-des-Anges to the right of the high walls of Château Royal de Collioure while some small waves wisper silently at the shore. Look at the bell tower at the church - which originally was not a church but a lighthouse - I think that I even red sometimes that it had been used as a prison. What a story for such a delight for the eye - as it was this afternoon. When I fold together my tripod and pack the camera in my bag I know this work must be presented as: "The beautiful blue colors of Collioure"